Aim and Objective: Reactive dye molecules are commonly employed to dye or modify colour characteristics of wool fibres. Yellowness of wool fibres poses a challenge and here, we report synthesis of a reactive fluorescent molecule and its application to wool fibres to reduce yellowness of the wool fibre and improve its colour features. Material and Methods: The new molecule was based upon 7-amino-4-methylcoumarin (AMC) and 2,4,6- trichloro-1,3,5-triazine (TZT). The synthesis involved a two-step chemical reaction, initiated by the nucleophilic substitution of a chloro group on the triazine ring with the hydroxyl group of 4-hydroxybenzenesulfonic acid. The substitution of 2nd chloro group at triazine ring with the amino group of 7-amino-4-methylcoumarin resulted in a novel molecule with a monofunctional reactive chloro group (AMC-MCT molecule). Results: The new molecule was applied to the wool fibres using exhaust dyeing method. This exhibited a high exhaustion value; however low fixation and total efficiency values were observed for the new molecule. The resultant wool fibres exhibited fluorescence which shows that aminocoumarin fluorophore retained its fluorescence when incorporated in the new molecule. An assessment of the molecule for yellowness index in a controlled exposure to UV radiation suggested an improvement in whiteness of wool fibre. 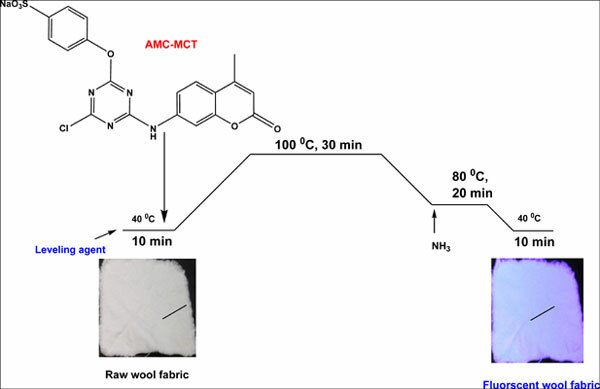 Conclusion: A novel aminocoumarin based fluorescent whitening molecule 2 has been synthesised and applied to the wool fibres. The new molecule continued to exhibit fluorescence after its application to the wool fibres. These results will encourage researchers to explore further possibilities for reactive whitening agent for wool fibres. Fluorescent whitening molecule, Keratin fibre, 7-amino-4-methylcoumarin, 2, 4, 6-trichloro-1, 3, 5-triazine 4-hydroxybenzenesulfonic acid, nucleophilic substitution.